Mindika Moments: I love pasta! This is probably one of my favorite recipes. It's so "Summer" to me! If you make it the healthy way...it's rather light and really refreshing. The lemon zest and splash of lemon juice in the sauce, give it a slightly tangy zip that you're not really expecting in a Carbonara. On another note: sorry I missed my "Monday Moment" yesterday. It was a crazy day! 1. In a small skilled, heat 2 T. oil over medium heat. Toast the bread crumbs until lightly browned. 2. Transfer to a small bowl and toss with parsley, zest, pepper flakes and salt. Set aside. 3. Bring a large pot of salted water to a boil for the spaghetti. 5. In a large skilled sauté bacon until crisp. Drain on a paper towel-lined plate; our off all but 1 t. drippings. 6. Add chicken; sauté 4 minutes or until chicken juices run clear. 7. Deglaze the pan with wine, broth, and lemon juice. Reduce by half, 2-3 minutes. 8. Add the cream and egg mixture to the pan, stirring continually. Cook for 3-5 minutes or until sauce thickens. 9. Meanwhile cook the spaghetti. Crain pasta into a colander with the frozen peas. Shake pasta to remove excess water. 10. 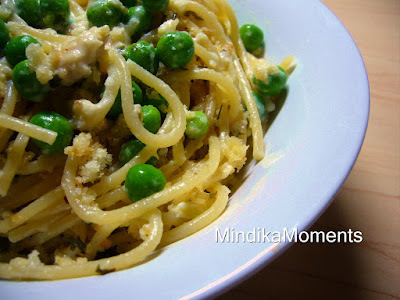 Mix together Pasta and peas, bacon, creamy chicken sauce, and bread crumbs. Toss several times until all ingredients are well incorporated. *I love having the bacon in this dish, but I often leave it out to make it a little healthier. You'll notice there is no bacon in the picture above. I also substitute the cream for evaporated milk. I think it still tastes great. But if you're not concerned about your fat intake or just want to splurge...go for it. It's delisious! I love the addition of the bread topping! Sounds so fresh and delicious. Perfect for summer. Yum.